Whether you run a beauty salon, a travel agency or a professional service, we are sure that you will find the right email template for you in SendBlaster. 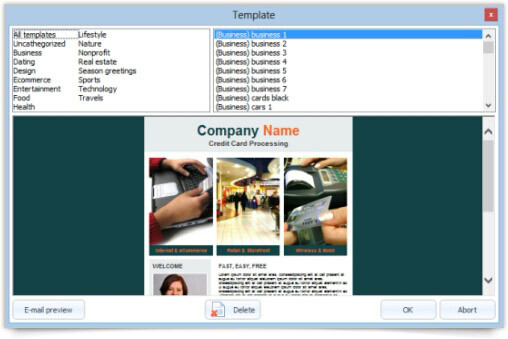 In fact, SendBlaster 3 comes with over 250 professionally-designed HTML email templates, including 100 brand-new original templates sorted by category. All templates have been tested and verified to work across all popular email clients, including Gmail, Yahoo! Mail, Hotmail, Outlook 2007, 2010, etc. This means that your subscribers will receive an email message that will always look great, regardless of which email program they are using. All you have to do is select your favorite template and customize it with your content, images and links! 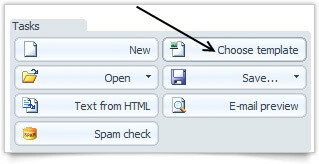 Open SendBlaster and click on the Compose message panel, then click on Choose template. Now you are able to choose your favorite template from among different categories, like Business, Entertainment, Food, Sports and Technology. You can choose from hundreds of different designs and layouts according to your needs and tastes. You can use our HTML email templates not only for your email newsletters but also for a variety of occasions, like email promotions, email invitations and Holiday greetings. Email templates that you find inside SendBlaster are for everyone, from beginners to HTML experts. There’s no need to write source code in order to use them. Newbies can pick them and customize them simply by adding custom text and graphics without writing a single line of code. On the other hand, programmers can edit html code using the inline HTML editor provided with SendBlaster or any other editor, like Adobe Dreamweaver (or Kompozer, as a free option). If you have designed a template from scratch and you will need to re-use it again, it’s a good idea to save the message “As Template“. You will find it quicker inside the list of templates. You can categorize you custom templates too! Simply write the category you want to list them in brackets + filename. It works for both existent and new categories. 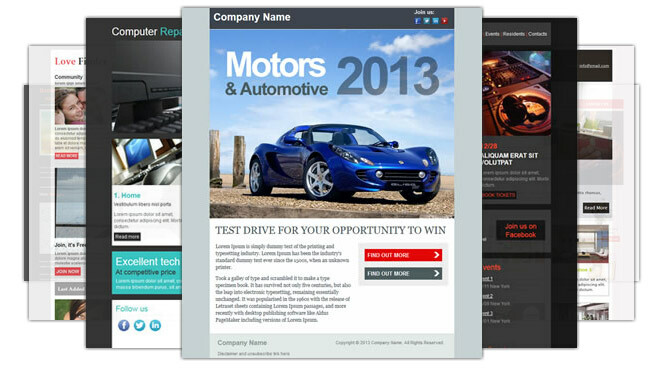 If you need a custom-designed email template, we can help as well. Our team of web designers will work for you and will design your unique email template according to your preferences and needs.